Instant Pot Caramel Recipe – Only 1 Ingredient! Okay, this is too good to be true: Instant Pot Caramel and made with just 1 ingredient!! Seriously, I am not kidding! Nothing more than the Instant Pot and a can of sweetened condensed milk. You can’t really consider water an ingredient in this recipe – can you? 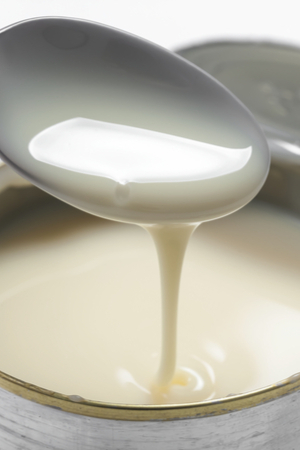 Smooth and creamy caramel – made with just one ingredient. When I was growing up, I only made caramel sauce by using rectangular caramel candies. I think it took me more time unwrapping each one than it did to melt them. Add in a little half and half and within a few minutes you have a thick caramel sauce. Years later, when I had my own kitchen, I decided to make my own homemade caramel sauce. I was more than happy to give up the unwrapping candy duty! I combined a little brown sugar, milk, and butter together and stood over the stove until it cooked down into a dark brown caramel sauce. It was delicious and worked well, but you must be careful to constantly stir the mixture. If you walk away for more than a minute, you will have burnt sauce. Sweetened Condensed Milk turns into a caramel in under 1 hour in the Instant Pot. What a sad moment – ruined caramel and the smell of burnt milk that lingers in the air. 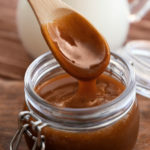 But a few years back, I was introduced to a caramel product that is popular in Latin America called Dulche de Leche. A friend just came back from a trip to Argentina and told me that I had to try this dessert spread. Once she told me that it tastes just like caramel I was in! We found a can of it at the grocery story and WOW – a thick caramel spread that is so versatile that it can be served with every meal. In the morning, spread some on waffles or serve with sliced bananas. Lunch time, add a little on your peanut butter sandwich or use it to sweeten your coffee or tea. And for dinner – think desserts! There is even an ice cream dedicated to Dulche de Leche! 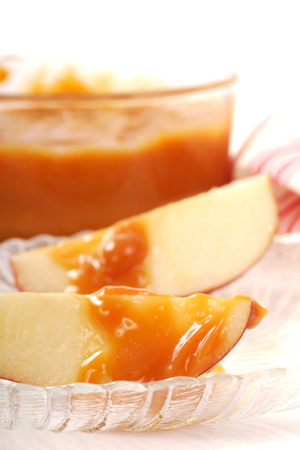 One of our favorite ways to eat Instant Pot Caramel – as an apple dip! I knew right away that I had to learn to make this delicious caramel substance myself. And I was so happy that the common modern way to make it was by using one ingredient! 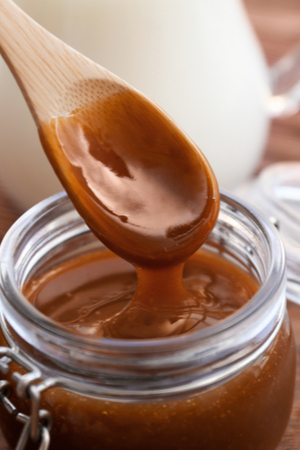 By using only a single can of Sweetened Condensed Milk, you can make your own caramel sauce. But I was very sad after I learned how long it took to turn the milk mixture into caramel. It would take 4 hours of boiling on the stove top before it would magically transition. And that meant I had to be near the kitchen for 4 hours to make sure the water didn’t get too low. I definitely didn’t have time for that! This can of sweetened condensed milk will magically be turned into caramel in under an hour! So I switched to the crockpot method. This cooking process took much longer than 4 hours, but at least I didn’t have to babysit a pot on the stove. And if you know how much I love my Instant Pot 6 quart Duo, you can probably imagine, I now make Instant Pot Caramel! There are two methods that you can use to make Instant Pot Caramel. 1. You can make it directly in the Sweetened Condensed Milk can. Simply remove the outer label, open the can and cover it with aluminum foil. 2. Pour the sweetened condensed milk in an oven safe container/mason jar, cover with foil and proceed with the cooking process. Cooking Process: Place the trivet in the bottom of the pot and add enough water so that the can/container is over half way submerged in water. Using a jar lifter makes taking out the hot mason jar or can safe and easy! Pressure Cook on High for 40 minutes. A quick and easy 1 ingredient caramel recipe made with just 1 ingredient! Open can of Sweetened Condensed Milk. 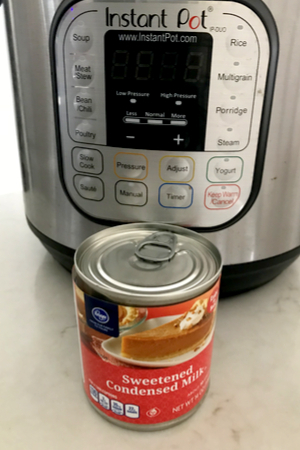 Add enough water to the Instant Pot to make sure at least half of the can/container is submerged in water. Add lid and place in the sealed position. Pressure cook/Manual on High Pressure for 40 minutes. Once cooking time expires, quick release the pressure. Using jar lifter or oven mitts, lift can onto a heat proof surface. 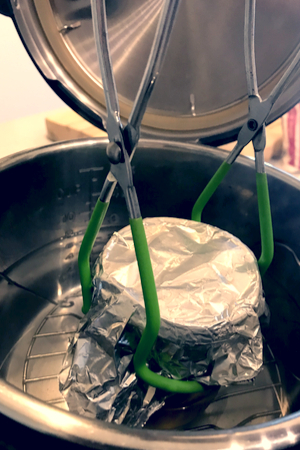 Carefully remove foil and stir to remove any clumps. Allow to cool and store in the refrigerator. You can make several cans at the same time using the same amount of cooking time. would this work in a crock pot? Yes, you would have to cook it for several hours in the slow cooker. Most of the time it is done by laying the entire can down in the slow cooker and cooking on low for 8-10 hours. Then submerge the cans cold water. Do not open until the cans are completely cool. However, I have never tried the mason jars in the slow cooker. Yes, I used to do it on the stove too! So glad it is so much faster in the Instant Pot! Can you make more than one at the same time? Would you increase the time? Yes, you can make as many that will fit in your Instant Pot. The time would remain the same. Just be sure to leave a little bit of room between each jar. Well, my first attempt did not work. Still very liquid after 40 minutes and quick release. Not sure what I did wrong. Do you put a lid on the Mason jar? Or just wrap the foil tightly around the top? I put foil around the top of the mason jar. It will thicken as it cools. However, if you are looking for an even thicker consistency you can pressure cook it longer. I would suggest to add 10 minutes to see what you think. Also, different brands will have different consistencies. I have always used generic store brands with good luck at the 40 minute pressure cooking time. Turned out perfect! Thank you!